The constitution of 1971 made Sierra Leone a republic within the Commonwealth. Adoption of the constitution of 1978 created a one-party republic based on the All People’s Congress; the head of state, or executive president, was elected by delegates of the All People’s Congress, and there was a parliament. Mounting political pressures and violence resulted in the adoption of a new constitution in 1991 that established a multiparty system. However, a violent military coup d’état in April 1992 installed a National Provisional Ruling Council (NPRC) and a new head of state. The NPRC subsequently named a cabinet and ordered the dissolution of the House of Representatives and the suspension of the new constitution and all political activity. The NPRC was reconstituted as the Supreme Council of State, and the cabinet was replaced by a council of secretaries in July, establishing stringent military rule. After democratic elections were held in 1996, the 1991 constitution was amended and restored, and the country returned to a multiparty system with an executive presidency and a parliament. The constitution was suspended again after a coup in 1997 but was reinstated the following year. The country is divided into four administrative units—the Western Area, which was the former crown colony of Sierra Leone, and three provinces (Northern, Eastern, and Southern provinces), which were the former protectorate. The Western Area includes the capital, Freetown. Northern Province is divided into five districts, Southern Province into four, and Eastern Province into three. The districts are subdivided into chiefdoms, which are controlled by paramount chiefs and chiefdom councillors. The chiefdoms are further divided into sections and villages. The chiefs are hereditary rulers whose local powers have been largely superseded by those of officials of the central and local government. Their influence remains important, however, particularly in matters of traditional culture and justice. In addition, there are district councils, which in some cases override the chiefdom administrations. The councils deal largely with local matters and are under the indirect control of the central government. Town councils, headed by a mayor, also have been established in the larger provincial towns of Bo, Kenema, Makeni, and Bonthe. The laws of Sierra Leone follow the pattern of British law. Until 1971 the framework of the courts was equally similar, and the final court of appeal was the Privy Council in London. Since the adoption of a republican constitution, however, the highest court is the Supreme Court, headed by a chief justice. There are local courts that take account of indigenous laws and customs, magistrates’ courts that administer English-based code, a High Court of Justice, and a Court of Appeal. There are presiding officers in the local, magistrates’, and juvenile courts. The attorney general is also the minister of justice. Before the civil war, most health and welfare services were provided by the central government. There were also a few hospitals belonging to religious societies, mining companies, and doctors. Every district in the interior had at least one hospital. The major hospitals with specialist facilities were in Freetown and Bo. However, the destruction wrought by the civil war left the health care system in shambles, with acute shortages of medical equipment and supplies, medication, and trained medical personnel plaguing the country even years after the end of the conflict. Life expectancy in Sierra Leone ranks among the lowest in the world. The Ministry of Health and Sanitation handles programs for the control and eradication of malaria and other infectious or endemic diseases. In other areas sanitation is under the control of district health authorities and town councils. The National HIV/AIDS Secretariat of Sierra Leone was established in 2002. The organization’s responsibilities include increasing awareness of the disease and of methods of prevention, promoting research, and allocating resources for treatment. Housing types vary greatly in the interior districts, depending on the availability of materials. Roofs can be made of grass in the savanna region or of bamboo in the forest areas. Walls may be circular or rectangular, constructed of dried mud bricks, palm fronds, or, more generally, lattice pole work filled with mud and coated with clay or chalk. There is usually a veranda attached to the dwelling. Houses with corrugated zinc roofs and cement walls can be found in most villages and towns along the roads. In the larger cities of Freetown and Bonthe, some houses that remain from colonial times were built of wood or laterite stone in a Brazilian or Victorian style and roofed with slate. Education in Sierra Leone is offered in private and government-sponsored schools; it is not compulsory. 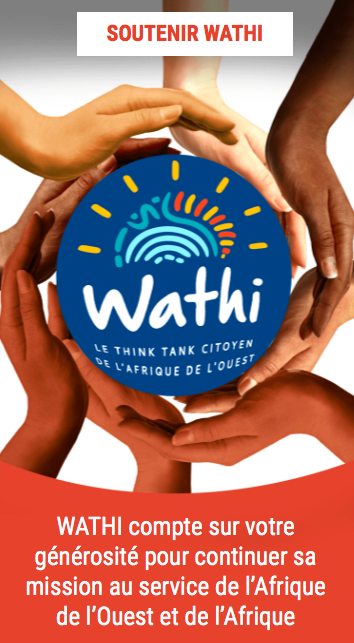 There are primary schools for children from age 5 to 12, secondary schools that offer a seven-year program, technical institutes, and several vocational schools, trade centres, and teacher-training colleges. The University of Sierra Leone consists of Fourah Bay College (founded in 1827), Njala University College (1964), and the College of Medicine and Allied Health Sciences (1987). Sierra Leone’s literacy rate is lower than the average in western Africa and is among the lowest in the world. The Poro society for men and the Sande society for girls play an educational role in village culture; initiation into these societies is a rite of passage. Holidays observed in the country include the Christian celebrations of Christmas and Easter and the Muslim festivals of ʿĪd al-Fiṭr (which marks the end of Ramadan), ʿĪd al-Aḍḥā (which marks the culmination of the hajj), and the birthday of the Prophet Muhammad. Independence Day is celebrated on April 27, the anniversary of Sierra Leone’s becoming an independent state within the Commonwealth. The most outstanding feature of the country’s cultural life is its dancing. The internationally known Sierra Leone National Dance Troupe first won widespread acclaim at the 1964–65 New York World’s Fair and continues to perform in the 21st century. The different communities of the country have their own styles of costume and dance. In addition, certain closed societies, such as the Wunde, the Sande (Bundu), and the Gola, have characteristic ceremonial dances. A wide range of agility, gracefulness, and rhythm is displayed; in addition, there are elements of symbolism in most of the dances. Drums, wooden xylophones (called balaphones), and various stringed instruments provide the musical background. The carving of various wooden masks in human and animal figures for the dances is especially advanced in the southern region. The Sande mask worn on the head of the chief dancer during the ceremony that welcomes the reappearance of female initiates from their period of seclusion is perhaps the best-known carved figure in Sierra Leonean art. It is a black symmetrically stylized head of an African woman with an elaborately plaited pyramidal coiffure adorned with various figures and with a facial expression of grave dignity and beauty. The iconography is of great significance and meaning. Ivory figures are characteristic of the Sherbro, Bullom, and Temne peoples of the coastal and northern regions. Fine examples of these figures, which were bought or commissioned by Portuguese traders during the 16th century, are still extant. There are also steatite human figures, sometimes distorted, called nomoli—or, in wooden form, pomtan (singular, pombo)—that certainly date earlier than the 16th century and were used probably for ancestor worship or fertility rites. At present they are used for ceremonies to ensure abundance of crops. Containers or rattles are carved from gourds and are decorated with intricate geometric patterns that are burned into them. The weaving of cloth, typically blue, brown, white, or a combination of these colours, is carried out in the southern and eastern regions by the Mende and the Kono. Thread spun from the cotton bush Gossypium is used in weaving. This handwoven cloth is an important item of barter and wealth and is used in many ceremonies and rituals. The cloth is made into coats for men or is worn as a wraparound lower-body garment by women and is also used as a bedspread. In the north, among the Temne, imported cotton or satin is tie-dyed in beautiful patterns with indigo, the red juice of the kola nut, or imported dyes. In the west, baskets are made with dyed raffia, and patterned slippers are fashioned from dyed wool. There is an active school of modern artists who were trained in Europe and the United States and whose paintings have been exhibited locally and abroad. Olayinka Burney Nicol, Hassan Bangura, John Vandi, Koso Thomas, and Gladys Metzger are among the best-known artists of Sierra Leone. There are also local artisans who have not been formally trained but who produce a diverse array of art. There has been a literary tradition in Freetown since the 19th century. One of the most prolific writers was James Africanus Beale Horton, who wrote books and pamphlets on politics, science, and medicine while serving as a medical officer in the British army between 1857 and 1871. A.B.C. Sibthorpe, lauded as the first Sierra Leonean historian of Sierra Leone, wrote one of the earliest accounts of his country’s history in 1868. There are also 19th-century works on exploration by Sierra Leoneans Samuel Adjai Crowther, an Anglican bishop, and John Christopher Taylor, another clergyman. Sierra Leone is represented in most anthologies of African- and English-language poetry and short stories. In addition, the novels and short stories of Sarif Easmon, William Conton, and Eldred Jones give a vivid picture of modern life in the country. One of the 20th century’s most prominent writers was Thomas Decker, who published several works in Krio and translated English-language works, including Shakespeare, into Krio. More-recent works by Syl Cheney Coker and Lemuel Johnson have contributed to Sierra Leone’s literary tradition. Sierra Leone also has representation in the world of theatre with playwrights Dele Charley and Yulisa Amadu (“Pat”) Maddy. The Sierra Leone National Museum in Freetown contains historical, ethnographic, and archaeological collections. Other museums include the Sierra Leone National Railway Museum, also in Freetown. Bunce Island, a national historic site, was once home to a British slave castle that operated from the 1670s until 1808; tours of the island are conducted among the ruins of the old dormitories, factory house, prison, and watchtowers. Fourah Bay College and Njala University College both have libraries; the former houses the public archives. There are about 18 ethnic groups that exhibit similar cultural features, such as secret societies, chieftaincy, patrilineal descent, and farming methods. The Mende, found in the east and south, and the Temne, found in the centre and northwest, form the two largest groups. 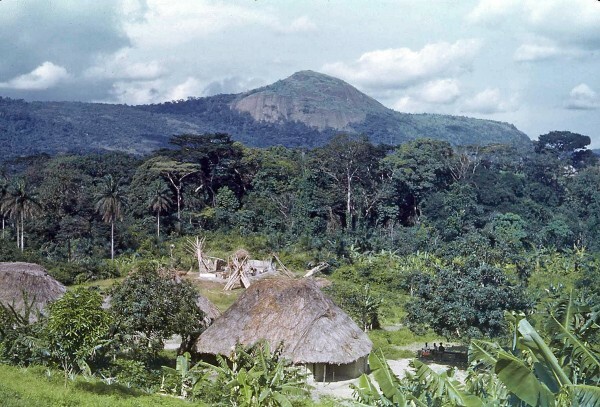 Other major groups include the Limba, Kuranko, Susu, Yalunka, and Loko in the north; the Kono and Kisi in the east; and the Sherbro in the southwest. Minor groups include the coastal Bullom, Vai, and Krim and the Fulani and Malinke, who are immigrants from Guinea concentrated in the north and east. The Creoles—descendants of liberated blacks who colonized the coast from the late 18th to the mid-19th century—are found mainly in and around Freetown. Throughout the 19th century, blacks from the United States and West Indies also settled in Sierra Leone. Ethnic complexity is further enhanced by the presence of Lebanese and Indian traders in urban centres. Krio, a language derived from English and a variety of African languages, is the mother tongue of the Creoles and the country’s lingua franca. 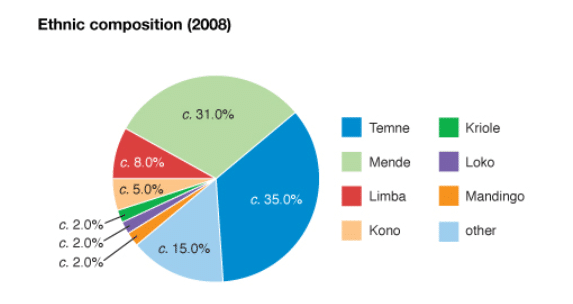 Among the Niger-Congo languages, the Mande group is the largest and includes Mende, Kuranko, Kono, Yalunka, Susu, and Vai. The Mel group consists of Temne, Krim, Kisi, Bullom, Sherbro, and Limba. English, the official language, is used in administration, education, and commerce. Arabic is used among Lebanese traders and adherents of Islam. School texts, information bulletins, and collections of folktales are produced in indigenous languages such as Mende and Temne. The Vai script used in Liberia and Sierra Leone has the distinction of being one of the few indigenous scripts in Africa. Some of the local languages are written in European script, and a few, especially in the Muslim areas in the north, have been transcribed into Arabic. About two-thirds of the population are Muslims, while about one-fourth are Christians. Less than one-tenth of the population practice a variety of traditional religions. However, this number does not include the many Sierra Leoneans who practice traditional religions in tandem with their professed Muslim or Christian faiths. Other religions—including Bahāʾī, Hinduism, and Judaism—are practiced by small percentages of the population. Archaeological findings show that Sierra Leone has been inhabited for thousands of years. Traditional historiography has customarily presented it as peopled by successive waves of invaders, but the language pattern suggests that the coastal Bulom (Sherbro), Temne, and Limba have been in continuous settled occupation for a long time, with subsequent sporadic immigration from inland by Mande-speaking peoples, including Vai, Loko, and Mende. They organized themselves in small political units—independent kingdoms or chiefdoms—whose rulers’ powers were checked by councils. Secret societies, notably the Poro society, also exercised political power, as well as instructing initiates in the customs of the country. Muslim traders brought Islam, which became firmly established in the north and subsequently spread through the rest of the country. Portuguese voyagers gave the name Serra Lyoa (“Lion Mountains”), later corrupted to Sierra Leone, to the mountainous peninsula at the mouth of the Rokel (Seli) River where, from the 15th century onward, European traders congregated near the site of present-day Freetown under the protection of African rulers, who welcomed them for the commercial opportunities they provided—namely, the exchange of imported manufactured goods for ivory and slaves to be employed across the Atlantic. After the British Parliament made the slave trade illegal in 1807, the British government took over the settlement (January 1, 1808) as a naval base against the slave trade and as a centre to which slaves, captured in transit across the Atlantic, could be brought and freed. Between 1807 and 1864, when the last slave ship case was adjudicated in the Freetown courts, the British navy brought in more than 50,000 “recaptives,” also known as “liberated Africans.” Drawn from all over western Africa, these heterogeneous people lacked any common language or culture. The government therefore introduced a deliberate policy of turning them into a homogeneous Christian community. The recaptives and their children, known as Creoles (today usually rendered Krios), prospered as traders, and some entered the professions, qualifying in Britain as doctors and lawyers. During the 19th century the area around the coastal settlements was drawn increasingly into the British economic sphere. There was a market in Britain for shipbuilding timber, and most of the accessible forest trees in the coastal country were felled, altering the environment irrevocably. There was also a European market for vegetable oils, and unprocessed palm produce and peanuts were supplied in return for imported manufactures. Rulers fought for control of the trading centres and built up larger territories for themselves. After World War II the British government gave in to nationalist demands in Sierra Leone, as elsewhere in West Africa. Democratic institutions were hurriedly constituted. The small Creole minority hoped to entrench their rights politically, but the 1951 constitution gave control to the majority. The government elected under it was led by Milton (later Sir Milton) Margai of the Sierra Leone People’s Party, a predominantly protectorate party. During the 1950s, parliamentary institutions on the British pattern were introduced in stages. The last stage was reached on April 27, 1961, when Sierra Leone became an independent state within the Commonwealth. The first years of independence were prosperous. Mineral resources (iron ore and diamonds) brought in substantial revenue, much of which was used for development, particularly education. Njala University College was founded in the early 1960s and amalgamated in 1967 with Fourah Bay College as the University of Sierra Leone. Sir Milton Margai died in 1964 and was succeeded by his brother, Sir Albert Margai. The opposition All-Peoples’ Congress (APC), led by Siaka Stevens, won the 1967 general election. But the army intervened and set up a military government, the National Reformation Council, under Lieut. Col. Andrew Juxon-Smith. After a year the privates and noncommissioned officers mutinied, imprisoned their officers, and restored parliamentary rule under Stevens and the APC. The subsequent years were stormy, the government regularly imposing states of emergency and executing its political opponents. In 1971 Sierra Leone became a republic, with Stevens as executive president. Meanwhile, the economy deteriorated; the supply of iron ore was exhausted, and most of the diamonds were smuggled, thus depriving the government of revenue. Stevens’s style of government encouraged his supporters to enrich themselves at public expense. Public dissatisfaction grew, led by student protests. Stevens’s answer was to introduce one-party rule in 1978. In 1985 Stevens retired, having chosen the head of the army, Joseph Saidu Momoh, as his successor. Widespread corruption continued, and the economy further deteriorated. The difficulties in the country were compounded in March 1991 when conflict in neighbouring Liberia spilled over the border into Sierra Leone. Momoh responded by deploying troops to the border region to repel the incursion of Liberian rebels known as the National Patriotic Front of Liberia (NPFL), led by Charles Taylor. Sierra Leone’s army came under attack not only from the NPFL but also from the Revolutionary United Front (RUF), led by former Sierra Leone army corporal Foday Sankoh, who was collaborating with the Liberian rebels; this was the beginning of what would be a long and brutal civil war. In April 1992 Momoh was deposed in a coup led by Capt. Valentine E.M. Strasser, who cited the poor conditions endured by the troops engaged in fighting the rebels as one of the reasons for ousting Momoh. A National Provisional Ruling Council (NPRC) was established with Strasser as the head of state. During Strasser’s administration the civil war escalated, with the RUF increasing the amount of territory under its control, including lucrative diamond mines—the source of the “blood” or “conflict” diamonds used to fund its activities. Strasser was ousted in another military coup in January 1996 after it was feared that he would not transfer power to a civilian government, as originally promised. Brig. Gen. Julius Maada Bio briefly assumed control of the government with the pledge that elections would soon be held. The RUF, however, requested that elections be postponed until it could reach a peace agreement with the government; this request was rebuffed, and the RUF intensified its violent campaign. Nonetheless, elections were still held: Ahmad Tejan Kabbah of the Sierra Leone People’s Party won the presidential election and took office on March 29, 1996. A peace agreement between Kabbah and RUF leader Sankoh, known as the Abidjan Agreement, was reached later that year in November, but it was not successfully implemented. The first post-civil war elections were held in May 2002, with Kabbah winning reelection with a majority of the vote. Kabbah’s administration focused on fostering reconciliation, maintaining internal security, and promoting economic recovery and reform. To that end, both a Truth and Reconciliation Committee and a UN-sponsored war-crimes tribunal (the Special Court for Sierra Leone) were established that summer, and UN peacekeeping troops remained in the country until December 2005. Economic recovery in the postwar years was somewhat aided by significant debt relief and the reopening of bauxite and rutile mines. Still, in the years after the war, Sierra Leone was consistently rated as one of the world’s poorest countries. On April 26, 2012, Taylor was found guilty of war crimes and crimes against humanity committed during Sierra Leone’s civil war, because he had aided and abetted the rebel forces who committed the crimes. He was sentenced to 50 years in prison. Taylor filed an appeal, but it was rejected, and his verdict and sentencing were upheld. Meanwhile, Sierra Leone held presidential and parliamentary elections in 2007. Ernest Bai Koroma of the opposition party All People’s Congress was elected president, and his party was successful in winning a majority of parliamentary seats. Koroma’s administration tackled the ongoing issues of rebuilding the economy, eliminating corruption, and improving the quality of life in the country. He also presided over celebrations in 2011 to mark Sierra Leone’s 50th anniversary of independence from Great Britain. Koroma was reelected in 2012 with almost three-fifths of the vote. Sierra Leone’s slow but steady progress in recovering from more than a decade of conflict was derailed in 2014 by an outbreak of the deadly Ebola virus disease that also struck the neighbouring countries of Liberia and Guinea. The outbreak was traced to a patient in Guinea who had died in December 2013. The disease emerged in Sierra Leone in March or April of the next year and spread rapidly, as efforts to curtail it were hampered by public health infrastructure limitations in the country. By the time that the outbreak was contained in 2016, the Ebola virus disease had infected more 14,000 Sierra Leoneans, killed almost 4,000 of them, and devastated the country’s economy. In the very centre of Freetown, in a roundabout surrounded by a concrete fence stands enormous tree – the famous Cotton Tree of Freetown. This tree serves as a symbol for the whole nation of Sierra Leone. Thousands of black people (then slaves) participated in the American War of Independence. They got a promise that veterans of war will be free people – but white people were filled with prejudice and too often the promise was broken. Many war veterans with their families decided to return to their home country in Western Africa. A group of such people arrived in the site of present day Freetown, founding the city on March 11, 1792. According to a legend the black settlers disembarked from the ship and went up to a giant tree. They held a thanksgiving service under this tree, thanking to God for their deliverance to a free land. 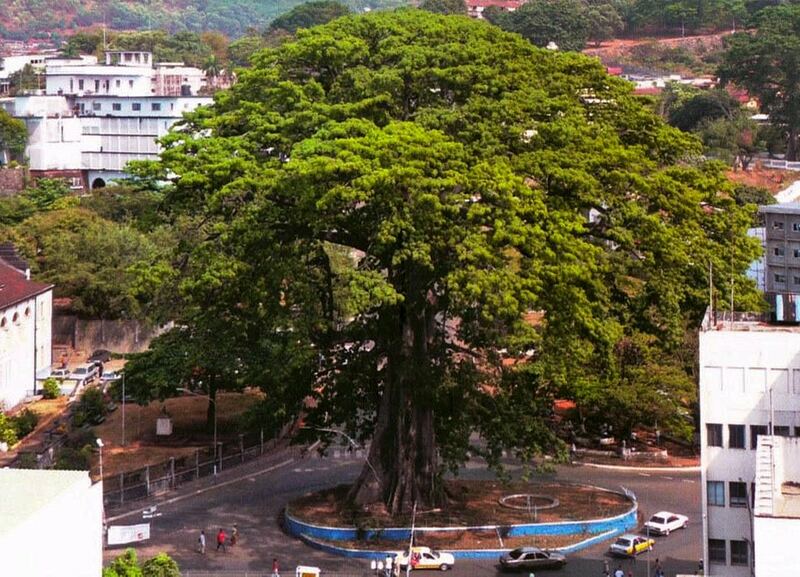 Now this tree is in the centre of Freetown. There are older stories about slave markets held under this tree – but there is also a contradicting story that the tree was planted by the freed slaves who brought it from America. It is assumed that this enormous tree is at least 500 years old. Wondermondo could not find any figures of its size – but Cotton Tree dominates above the surrounding houses and seems to be higher than 30 m. A bat colony lives in the tree. Today the Cotton Tree is seen as historical symbol of Freetown. Even more – it is seen as a symbol of Sierra Leone by its natives who live abroad. This silent giant has been a witness of the history of Sierra Leone indeed. The National Museum of the country was founded under the tree in 1957, in the former Cotton Tree Station. Tree saw the suffering and hope of people in the dark times of Sierra Leone civil war in 1991 – 2002, including the brutal invasion in the city in January 1999. Many local people attribute Cotton Tree with magical properties. Ceiba trees have a special meaning for local cultures, e.g. they were planted along the fortifications, which were built in the times of slave trade. La Sierra Leone est une république constitutionnelle dotée d’un parlement monocaméral. La Constitution de 1991 de la Sierra Leone a été modifiée à trois reprises depuis 2005.1 Parmi les principales modifications figurent des dispositions concernant la Loi sur la lutte contre la corruption et l’utilisation du registre existant d’électeurs pour les élections partielles (bien que le registre n’ait pas été révisé ni réexaminé comme prévu). Le Président est le chef de l’État et détient le pouvoir exécutif suprême. Il est élu au suffrage universel direct pour un mandat de cinq ans, renouvelable une fois. Le Président est assisté d’un vice-président (élu en même temps que le Président). Le Président est conseillé par un Cabinet des ministres. Le Président actuel a été réélu pour un second mandat en novembre 2012. Les prochaines élections présidentielles sont prévues en 2017, tout comme les élections parlementaires.La Sierra Leone est divisée en quatre régions administratives: la province de l’Est, la province du Nord, la province du Sud et la province de l’Ouest (où se situe la capitale, Freetown). Les provinces sont divisées en 12 districts, dans lesquels le gouvernement central est représenté par des conseils de district, et en 149 chefferies. Les chefferies sont dirigées par des chefs traditionnels (grands chefs), élus à vie par les autorités tribales, qui sont responsables de l’administration courante de leurs localités. Le pouvoir législatif appartient au Parlement. Le Parlement comprend 124 membres élus pour un mandat de 5 ans: 112 membres sont élus directement par blocs de districts et 12 indirectement afin de représenter les districts provinciaux. Les dernières élections législatives ont eu lieu le 17 novembre 2012. D’ordinaire, un projet de loi adopté par le Parlement devient une loi une fois ratifié par le Président. Une loi ne peut entrer en vigueur avant sa publication au Journal officiel. L’ensemble de la législation se fonde sur la Constitution, les lois, ordonnances et règlements, et le droit coutumier. Les traités et les accords internationaux, une fois ratifiés et publiés au Journal officiel, priment les lois nationales. Sous la responsabilité du Président de la Cour suprême, le pouvoir judiciaire est indépendant des pouvoirs exécutif et législatif, et est détenu par la Cour suprême, la Cour d’appel et la Haute Cour de justice. La Cour suprême est la juridiction d’appel en dernière instance et l’autorité de tutelle de l’ensemble des tribunaux de la Sierra Leone. La Haute Cour de justice est compétente en matière civile et pénale. Les recours sont portés, en première instance, devant la Cour d’appel et, en dernière instance, devant la Cour suprême. Les juges, y compris le Président de la Cour suprême, sont nommés par le Président avec l’approbation du Parlement.